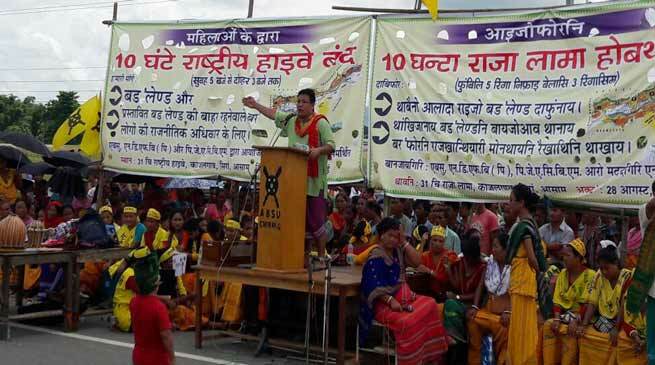 Bodo Women’s living in BTAD area, Blockade National Highway-31 at Kajalgaon and National Highway -15 on Monday in support of creation of Bodoland. Addressing the gathering ABSU president Promod Boro said that the agitational programme by different Bodo organisation to be continue until the government resolves the issue for once and all. The Bodos had lost more than 5000 lives for creation of Bodoland state and now it is the time to resolve the issue as the BJP government voted to power with the commitment to resolve the issue in the entire nation, said promod Boro. It must be mention here that a Political Level Tripartite talk on Bodoland Issue was held on 26th April 2017 under the Chairmanship of Union Home Minister Rajnath Singh. The BSU, and other orgnaisation took part in this talk. Meanwhile the Bodo women also anticipates a Permanent solution of the long pending Bodo Issue within short period for the interest of sustainable peace and all round development in the region. The Bodo women group is determined to protect their unique identity and culture at any cost and for that the movement has been continuing for last 50 years.